Point of Success Employee Timekeeping is an add-on product designed to work exclusively with Point of Success POS software. No matter whether you use Point of Success on a single computer or on a dozen computers on a local area network, your employee time clock can be made available on any or all of your computers. Employees can clock in or clock out anywhere on a network because all time clock entries are synchronized to within one second with the database server computer. Enter a PIN number and touch the In, Out or Correction button. Optionally ask employees to enter cash tips when they clock out. If an employee is set up to work in several positions, the Employee Timekeeping module can ask which position they are working when the employee clocks in. 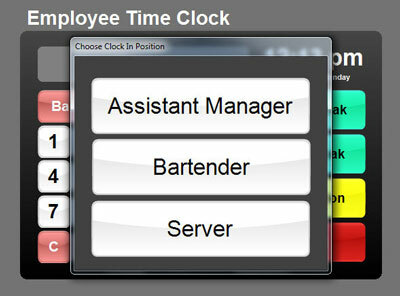 Time clock errors can occur frequently in a busy restaurant. 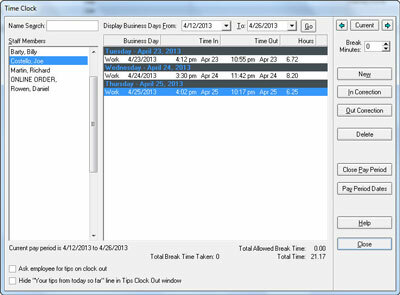 A missed clock in or clock out record is corrected in this easy-to-navigate window. 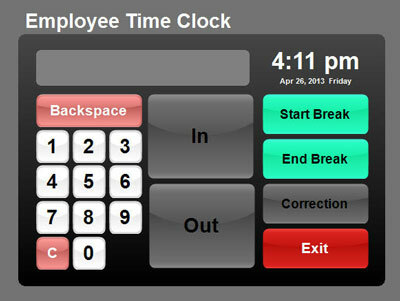 Select the employee for which a time clock correction is to be made. 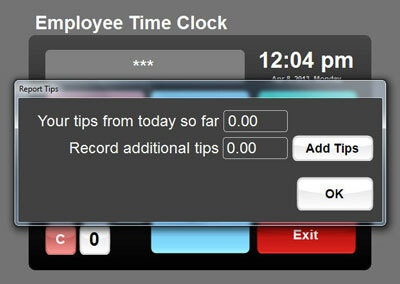 Touch the time clock record to be corrected, then touch the In or Out button to change the time. Time clock corrections are protected with Point of Success security features, allowing only designated employees to change or correct time clock records. 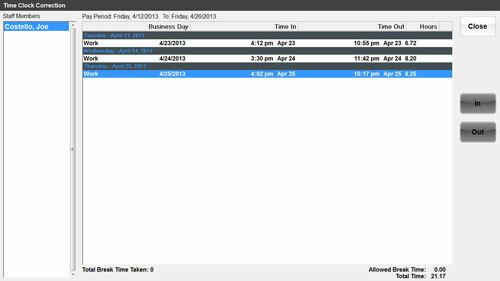 The time clock office manager console opens with a link in the Staff center in the Point of Success Office Manager program. Enter and correct time clock entries, view time clock entries, and close pay periods. Point of Success Employee Timekeeping prints reports to assist with payroll production. Time reports list employees who worked during the pay period and their hours.